Spraddle leg, also referred to as splay leg, is a condition where a chick’s legs “splay” out to the sides. One or both legs may be affected. Often it occurs from brooding chicks on a slippery surface such as newspaper. Other causes include incubator temperature issues (if a large number of chicks are affected at hatch, this is most likely the cause), vitamin deficiency, or being in a poor position in the egg. All poultry are at risk for spraddle leg. If you search for solutions to spraddle leg on poultry forums, you will see suggestions for securing the legs in place using bandaids, medical tape, or string. The Chicken Chick likes to use VetRap for easy application and removal. The idea is to allow the legs to strengthen in the proper position. Spraddle leg can usually be fixed with no long term effects as long as it’s dealt with early. But what if the bird is too tiny? We just wrapped up a hatch of quail. These little dudes are about the size of a half dollar when they break free of their eggs. The hatch occurred over the course of three days, with the last one coming almost a full 24 hours after everyone else. This last one was having a lot of trouble finding its feet and frequently tipped over onto it’s back or side. It had most likely outgrown the egg shell since quail grow at such an astounding rate. Since it was so tiny, using traditional methods for spraddle leg weren’t going to work. Trying to attach anything to legs the size of tooth picks would have resulted in more harm than good. Instead, I pulled out a pint glass from the dry bar. This trick I’m about to tell you about will work with all young poultry, but you will have to tailor your drinking glass to the size of your bird. First, stuff some paper towels in the very bottom of the glass so it looks like a nest. Then, place your spraddle legged chick inside the glass. Enjoy an hour-long TV show (I watched Arrow) while your chick does its Physical Therapy. The chick is nestled into a standing position by the sides of the glass and the paper towel. Obviously, the chick will want to pop out of the glass, so it will push and push with it’s legs to get over the edge. This strengthens the legs while they are in the proper position. In severe cases, it may take a few sessions of drinking glass physical therapy to repair the damage. For our little quail chick, one session was all it took. The chick was separated from the other quail for the night because she was smaller and still balancing on her hocks. The next day she was ready to join the group. The only indicator now as to which quail chick it was is that the affected chick is smaller than the others (due to hatching late). 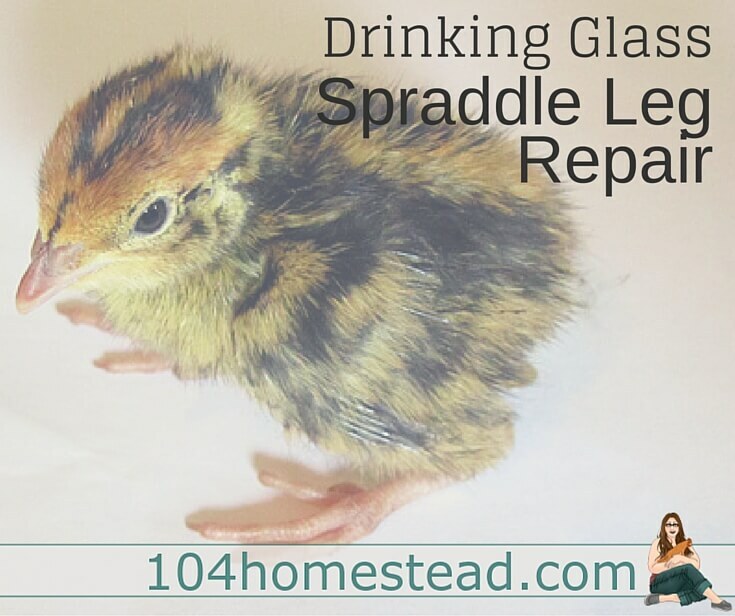 Make sure you are paying close attention to any chicks affected with spraddle leg. It may be neccessary to keep them separate from other chicks so they do not get trampled or picked on. It also helps in monitoring their food and water intake. Chicks with spraddle leg often cannot access water and food independently and are at risk of drowning in waterers. Although chicks can survive without food for the first few days of life, water is essential in their recovery and overall health. Save-a-Chick should be added to the water of any chick that is having a rough time after hatch. If you incubate your own chicks or order day old chicks online, it’s wise to have Save-a-Chick in your arsenal just in case. I’m just wondering if you had a photo of this method? I’ve had 6 baby quail hatch overnight and 4 have splayed legs. I’ve taped them as per other youtube suggestions but this may ba a better solution. Hello…..we have a week old chick that has spraddle leg in both legs. We braced them up with vet tape but he has no desire to stand. He lays and eat and drinks. I try to lift him up, but he won’t try to lift himself. If I try to use the glass, do I keep the brace on? Thank you. Hi there, I’m a lot late to this so I’m not sure if my situation can be helped. I was given a 10 month old Coturnix Quail and he has a splayed leg. He is eating and drinking fine, but he is only able to lay on his side. He gets around by his wings and uses his feet to kick himself around but he can not stand. He also has some diarrhea going on. So maybe I have two problems going on. He has actually come a long way since I got him as before he was rather listless and not getting around much. I wanted to at least give the little fellow a chance and he certainly has perked up in the week and a half since I’ve had him. But I would like to see him be able to walk if there is any chance of it. Thank you so much for the post I made an incubator and put four quail eggs in all but one came out with spraddle legs. This post was a life saver.iknow some say the best thing is to put them down but if there is a chance, why not try it. I was upset and stressed before I found this post .But after only one therapy session I found a big improvement. Hey! I’m a little late to the party but I just wanted to say you are a LIFE SAVER! Literally. Yesterday we acquired three bantam chicks (FREE) from our feed supply because the lady said they would most likely die there, so why don’t we take them and give them a chance? Last night we worked with the worst of the three and it actually was pretty happy in its glass. We saw definite improvement and today she’s walking better! Thank you for saving our banties! Ah Thank you. Today I saved a quail thanks to your post. It hatched today and could not walk due to curled toes and legs sticking to the sides. I taped the feet with bandages for a few ours and they looked better but legs still to the side, then an hour in cup and is now walking and eating. I also put some shelf liner so that it could get more traction. Cheers! I wish I read this a few months ago. I used surgical tape, it worked, but it was a nightmare to put and remove the bandage. So do you use a champagne glass? Like the skinny ones? Would sure love some video on this! I’m hoping we don’t have another occurrence any time soon, but if we do, I’ll be sure to record it and add it here. We are done with quail for this year and it doesn’t often happen with our chicken chicks. Had a pheasant chick this morning with SEVERE spraddle leg. Looked like she was rowing a boat rather than walking! Seriously! So into a glass she went with paper towel footing. Left her for 2 hours there in brooder not too close to the heat. After two hours, no spraddle, walking normally. Two hours after that, walking like all the other chicks (I knew which one she was because I marked her with marking pen, otherwise I couldn’t has found her!). I’ve tried tying legs, it just is too difficult. I often put them back in with the eggs for a while, that helps, but this is far better and in such a short time. Thank you so very much for posting this treatment!!! I took picture of her in glass but can’t seem to attach. Dear Jessica we are living in the middle of no where southern france, a neighbour gave me about 10 chicks with one hen as so many of her hens were treacherous this year and hid out til their eggs hatched…anyway to cut a long story short one little one has this dilemma and I thought it was just that…good circulation but tape did not work and after a while just left it, named him Mephibosheth. Now I will try your physio with it and hope its not too late and set. I’m not sure how old it is, but there is still hope. It may take more “sessions” before you see results. 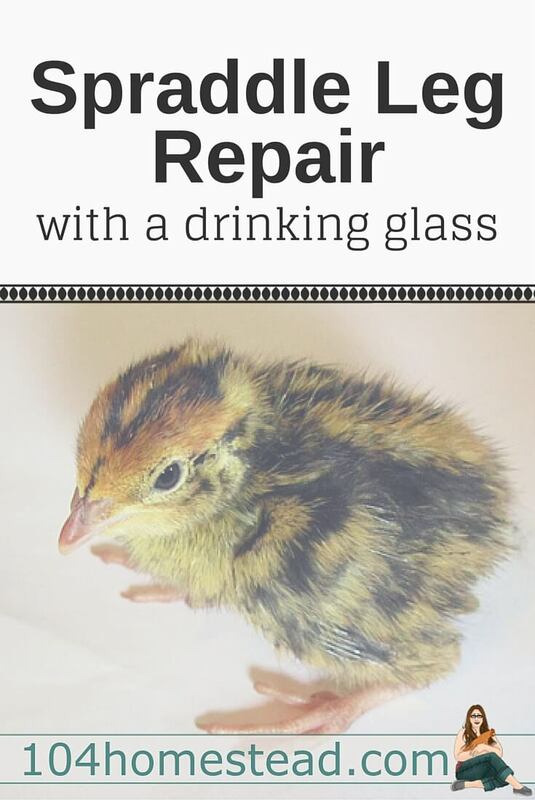 If the chick is able to get around, it may still be okay, even if it’s not repaired. A friend of mine rescued two chickens with legs lost to frostbite. They get around using their wings. It’s actually quite impressive. we have a 2-week old guinea chick. She developed this a few days after birth. So do you think this trick will still work? The sooner the better, but there is still hope. Obviously, you’ll need a larger glass. You want it to hold the chick upright, but not squish it. I have a feeling you will need to do it a few times since the chick is older. This is a great solution to a very common problem. You’re a genius! What a cute quail chick. Your kids must be over the top with excitement. They are head over heels in love. They named the one gold one because it’s the only one you can pick out of the mob. This is great, I don’t have chickens yet, but I will be referring to this when I do get them. Pinned for later.